I propose a new Gold level Sportsmanship badge. I earned the silver badge June 4th, and I continue to vote for competing answers. I would like to feel that I am working toward something, not because I would otherwise cease to vote for these answers, which clearly I have not, but because it adds to the fun of the site, just like the other badges. 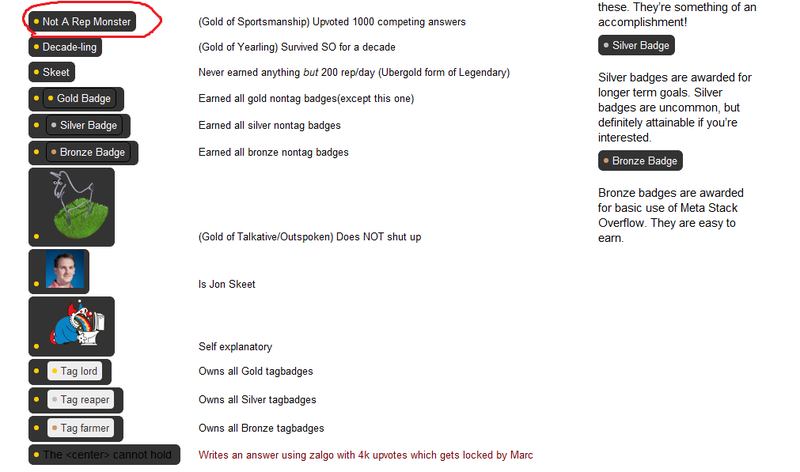 Following the ratios of some other badges, since the silver is at 100, perhaps 400 votes for competing answers is a good level? When I asked this question I was unaware that all votes for competing answers were counted, believing it was limited to the number of questions. Since in fact all votes are counted I think the threshold needs to be higher, perhaps 1000 votes as suggested by user unknown. This feature request is fairly popular but has failed to reach critical mass. If anyone has new ideas about how this request might be changed to make it more likely to succeed please share them. The community should at least be aware of this parallel development. Perhaps that question should be migrated here and combined with this one as I believe badges are network-wide? Any missing or controversial aspects of this question could be edited appropriately. First of all, I second the request. Since upvoting a tremendous amount of competing answers implies that the user actually cares about the question getting answered instead of just wanting to "score" himself, I suggest Team player. I like Corinthian spirit, but I think this is very much a British English-only phrase. How about "Not a rep Monster"? Or, "Not A Rep Whore"
I wanted to design a badge for it but got bored and completely redesigned the gold badges. I'd call the badge "Spirit". The spirit of the site is to get all good content up to the top where it can be as useful as possible. If you consistently up vote based on merit alone, even if it means another answer scores higher than your own, then you have the spirit of the site at heart. And yes, I think that does deserve a gold badge. By the time someone reached ~400 - 500 votes, it means we're just rewarding someone again for consistent, desirable behavior. That's precisely what badges should be doing. In the spirit of terms like "Fair play", the ideas of ethics and friendly competition embodied in "Sportsmanship", and just plain fun, I propose that the badge be called Good Game. I quite like "Gentlemanly Conduct" as a name - again possibly a little British, but my other suggestion, "Jolly Good Show! ", might have been a little over the top. Gentlemanly Conduct does capture the spirit of fair play and sportsmanship in a nice phrase. I second the request, but would suggest a higher threshold, like 1000 votes. Inspired by the answers from AakashM and Tim Post. but maybe this badge is a little bit more easy to grind at than a gold badge ought to be. There's also the room people to avoid the incentive by up-voting on questions that are weeks or months old(thus not putting their own answer in jeopardy). You might want to put some sort of time-limit on this, or only count votes that occur before the OP has accepted an answer. Adding the requirement to have 3+ score on your own answer is the key and wasn't suggested before as far as I can see, and it would both make it harder to gain and harder to game. Good sportsmanship doesn't require badges. If you are upvoting others' posts, you are not doing it for money, fortune, or stinkin' badges. You simply do what you feel is right. To be rewarded for this by others on StackExchange seems as incongruous as being rewarded for something right in real life. Not the answer you're looking for? Browse other questions tagged feature-request badges badge-request . Does SE have too many badges? Do Sportsmanship badge votes count after an answer is accepted? I've upvoted 100 answers; why don't I have the Sportsmanship badge?